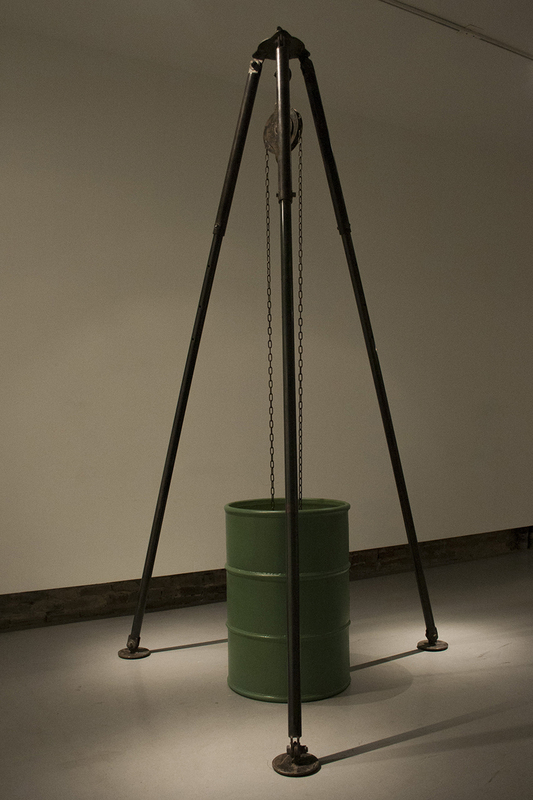 Fabricated steel, patina, chain, and lard. 10' x 4' x 4'. Gibbous was exhibited in February and March, 2016 alongside two other sculptures in a solo exhibition titled 'Homesteading' at Hamiltonian Gallery in Washington DC. 'Dane Winkler activates Hamiltonian’s back gallery with a host of new sculptural work that approximates a dystopic farmyard in Homesteading. Across this installation, Winkler contrasts heavy industrial machinery with straw, sheep’s wool, and mud in three sculptures that imply self-sufficiency, survival, and the fulfillment of one’s most basic needs. At the same time, Winkler’s contextualization of pastoral materials within the white cube gallery space foregrounds moral issues of subsistence amid our urban and cosmopolitan surroundings.' Images courtesy of Hamiltonian Gallery.